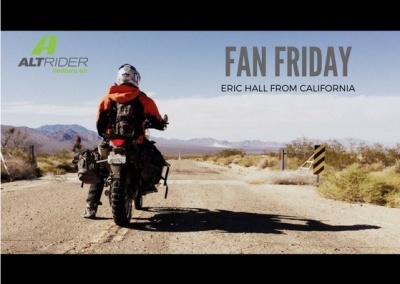 Our featured rider for AltRider #FanFriday is Eric Hall, founder of XLADV.com, an online community dedicated solely to big adventure bikes. This photo was taken in our #TasteofDakar event. "I think I first learned about AltRider at the Long Beach IMS show at their booth. I got my first farkle, a side stand enlarger and they gave me a sticker that I dutifully put on my bike. What I like most about AltRider is the quality of their products. They are well built and hold up to a higher level of abuse. I also like that they get involved with riders through their regional rides. I ride our 2011 KTM 990 Adventure which is our project bike. My RotoPax and Synch bag are both from AltRider." Thanks, Eric! If you all like adventure bikes, be sure to check outXLADV.com .